Post-Vietnam Era marked a turning point for AU. 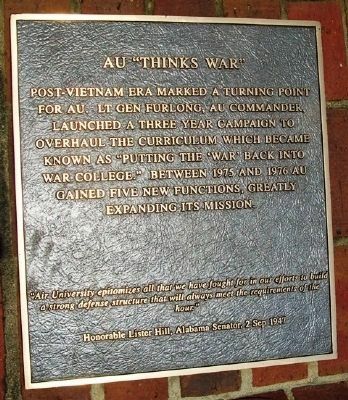 Lt Gen Furlong, AU commander, launched a three year campaign to overhaul the curriculum which became known as “Putting the ‘War’ back into War College.” Between 1975 and 1976 AU gained five new functions, greatly expanding its mission. Erected by The Air University Foundation. Location. 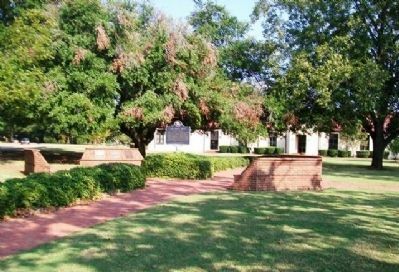 32° 22.712′ N, 86° 20.557′ W. Marker is in Maxwell Air Force Base, Alabama, in Montgomery County. Marker is at the intersection of Maxwell Boulevard and Magnolia Drive, on the right when traveling west on Maxwell Boulevard. Touch for map. Marker is in Maxwell Park. Marker is in this post office area: Montgomery AL 36112, United States of America. Touch for directions. 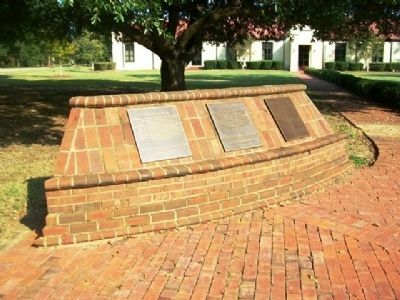 (here, next to this marker); Expansion of Air University (here, next to this marker); Chennault Circle (here, next to this marker); a different marker also named Reorganization (here, next to this marker); Joint Programs (a few steps from this marker); The Next Fifty Years (a few steps from this marker). Touch for a list and map of all markers in Maxwell Air Force Base. More. Search the internet for AU "Thinks War". Credits. This page was last revised on June 16, 2016. This page originally submitted on April 13, 2013, by William Fischer, Jr. of Scranton, Pennsylvania. This page has been viewed 503 times since then and 3 times this year. Photos: 1, 2, 3. submitted on April 13, 2013, by William Fischer, Jr. of Scranton, Pennsylvania.